Is it just me or does Re:Coded in KH 2.5 have some correct english lip-syncing? 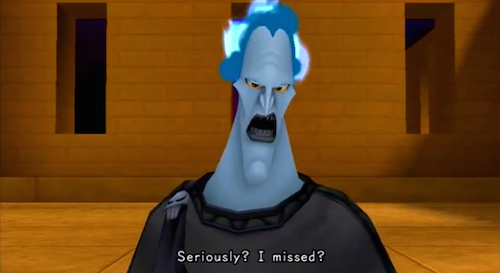 I was watching the Colosseum cutscenes in English the other day and I could have sworn that Hades had correct lip syncing in the English Dub. I looked at it REALLY closely and I'm relatively sure that he's been synced with the English Dub and not the Japanese one. If you look carefully in the Japanese dub during the "Seriously? I missed." line you can see that Hades mouth fully opens in the final syllable of the line (seen below), but looking at the English dub, the mouth syncs up to James Woods' (English VA) dialogue and the mouth never fully opens like that. I find this weird, especially because I've been informed and noticed that most of the remastered Re:Coded and all of the remastered 358/2 Days cutscenes are synced with the Japanese VA.
Maybe some animators had some spare time in between the Japanese and English releases for 2.5 HD Re:MiX and decided to convert some of the more obvious lip syncing animations to English? Yeah the sync is still full japanese. Guess rendering everything with english synch would be taking too long. I think the few scenes which do fall good in synch are purely a coincidence. It's not a really big problem for me in the long run though. Just a bit weird at the beginning when you notice it. Iunno. Some still seemed a little out of sync, but weirdly enough, at least one scene looked in sync when I played it. That scene was the one where Terra, Aqua and Ventus are having their sort of falling apart moment after their battle with the Trinity Armor. Specifically, the part where Terra yells, "Just stay put!" I believe they did do BBS and KH2 in full sync. Makes me wonder more why they didn't bother on Coded. Either way I think it's not good to pay too much attention to it. The more you notice it, the more it'll bug you. Just like when a tv show is badly synchronized with the sound. Probably because the japanese dub for Hades took more time to finish than the english one. Because of this, they animated to synchronize with the english dub. This If the dub for both japanese and english are made at the same time.